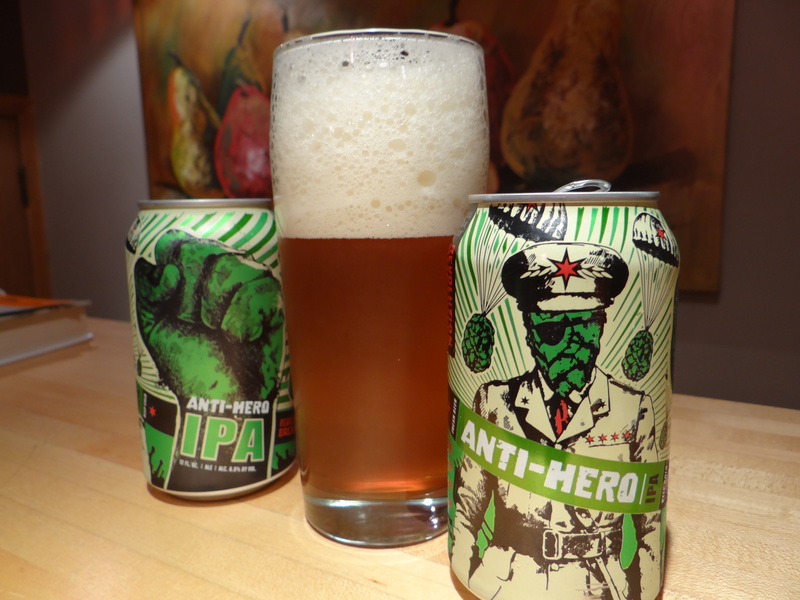 Notes: I’ve got a couple of cans of Anti Hero IPA left over from the IPA blind taste test challenge, where it went down in Round 1 to the eventual champion, White Rajah. So I thought why not give it a full review. First of all I have to comment on the interesting art work on the can. Revolution has a cool theme to their beers. (Editors note: The movie Drinking Buddies with Olivia Wilde was set in part in the Revolution Brewery in Chicago.) The beer is a slightly hazy amber color. This is three beers in a row that I’ve reviewed that produce an impressive head. This one is probably 4 fingers that slowly settles, leaving behind an intricate lacing pattern. Great aroma coming off this beer. Classic American IPA, a nice mix of pine and grapefruit. Coming to the taste pine takes the upper hand. The expected IPA bitterness is there, but it’s not overwhelming. The mouthfeel/finish is resinous and a little sweet. The sweetness became a little too much by the time I got to the bottom of the glass, which caused me to drop my rating from 7.5 to 7.25 (a 3/4 point lower than I rated it in the IPA taste test). It does everything you would expect in an IPA, but it doesn’t have the extra something to rise above a crowded field.